As Diwali is around the corner,I want to post some traditional Indian sweets and therefore made this sweet few days ago and it vanished right away after clicking the pic around 10 p.m. Though the recipe seems long, it is very easy to make it. All you need is paneer,khoya ,sugar and lil bit of ghee. I believe,in all Indian households,paneer is a frequent item for cooking and therefore we make it regularly @ home. 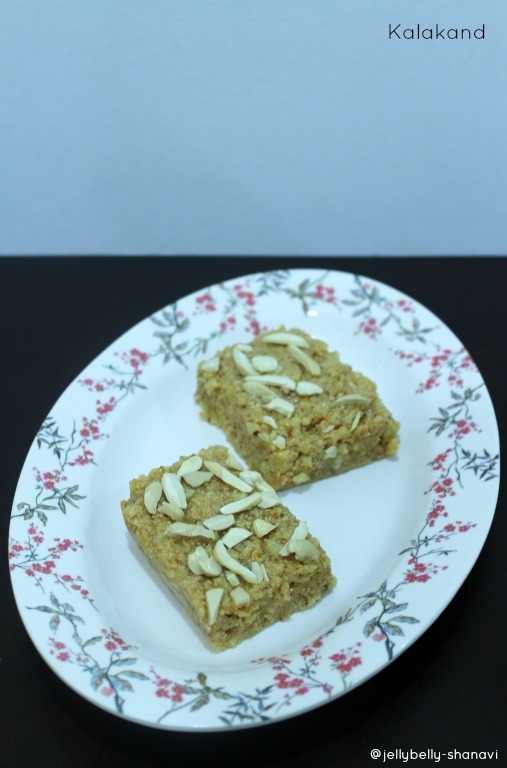 Here I've given one easier version of making khoya,that just takes 2 minutes to put together the ingredients and rest is the cooking time.In the end, u can have a easy peasy kalakand which is really really delicious. * Mix ghee .milk powder and combine well. * Add milk little by little and form a smooth dough. It's ok,if it sticks a little. * Transfer this dough to a thin muslin cloth and tie it's ends. place the trivet in the center. Now place the bowl on top of the trivet . the khoya out. Store it in a refrigerator after it cools down for future use. Heat a non stick kadai and melt the ghee. Add the grated khoya,milk. Stir well until the khoya incorporates thoroughly. Now crumble the paneer and add it to the khoya.Combine well. Keep the flame in medium flow. Now add the sugar and stir continuously. The mixture would look watery now and keep on stirring the mixture for 7 to 10 minutes. 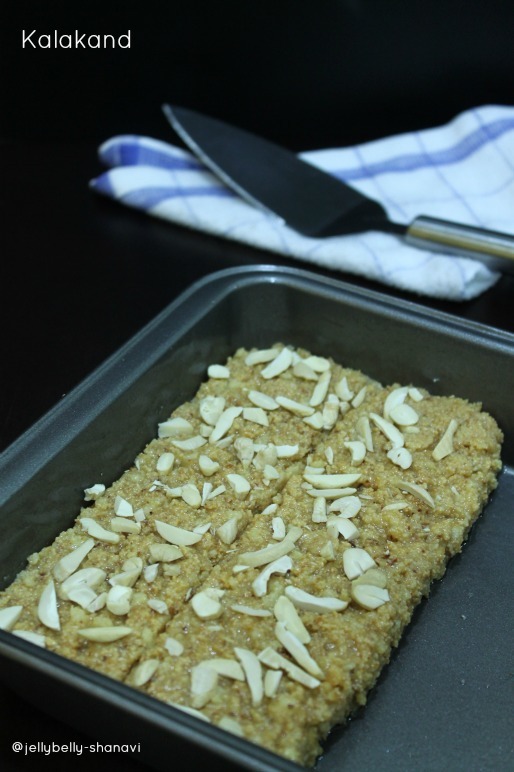 At one stage,the mixture would become a solid mass and will be very thick,not sticky with the pan like halwa. Grease the plate with ghee and transfer the mixture to the plate. Even them to have an inch thickness and top it with the chopped nuts,press it down with a light hand. Make cuts very lightly and let it cool down completely. Cut into squares and serve. Refrigerate the remaining for longer shelf life. Recipe for instant khoya is adapted from here. Traditionally pistachios are used for garnishing but I've used cashew and badam flakes as my nearby shop let me down from stocking it. If you have any doubts,do drop a comment here and I'll get back to u ASAP. that looks divine. so well made. 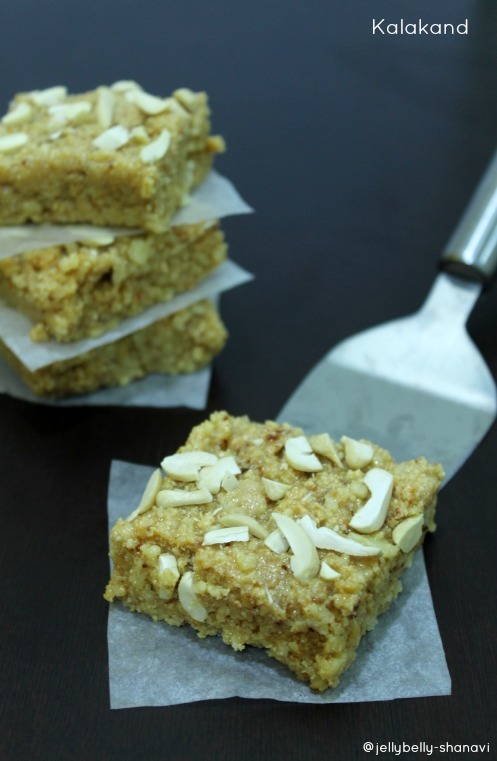 Diwali sweetsaa,kalakand kalakuthu Shobana, super tempting squares. 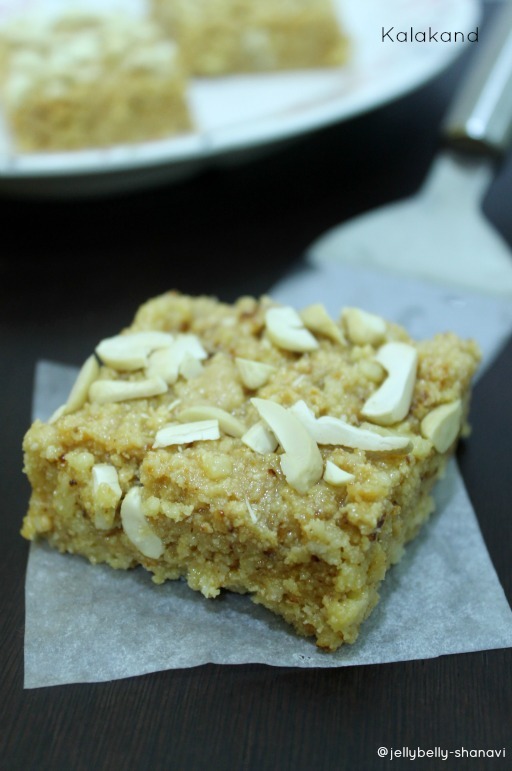 Absolutely delicious shobana...For sure it is a winner recipe..
Kalakhand is my absolute fav of sweets - love it! and your recipe makes me want to eat so much of it right now! Looks delicious and superb..will try your version of instant khova. hi it looks delicious, i have one doubt,for preparing khoya we need to keep it in silver bowl only not in steel bowl? It looks delicious, i have one doubt, for preparing khoya we need to keep it in silver bowl only, not in steel bowl? Hi Sujatha, thanks for dropping b, I meant to say stainless steel bowl only.